It's fairly straightforward to bounce out track sections to audio, import them into Live's Session View, arrange them into different scenes, then retrigger them live. However, if you've made a track in Live's Arrangement view, it's even easier. Live 9's Consolidate Time to New Scene feature consolidates all the audio and MIDI within a selected time range to a new scene over in the Session view. Check out this Live 9 project (click to download). The first save contains the full track laid out in the Arrangement View; the second version houses each separate track section consolidated to a new scene over in the Session View, with each clip's automation intact. Follow the walkthrough below to find out how it all works. 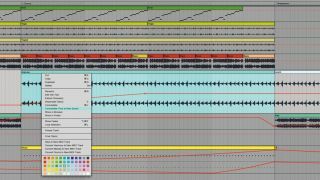 Step 1: Here's a House track created in Live 9's Arrangement View, comprised of both audio and MIDI parts. We've used automation on various elements for movement and interest. Track markers divide up the arrangement into relevant sections: intro, break, drop, chorus etc. Step 2: We highlight a region that's the length of our Chorus section, then right-click and choose the Consolidate Time to New Scene option. Live consolidates all of the highlighted section's audio and MIDI clips over to a single new scene in the Session View. Step 3: After converting all of our track's sections to new Session View scenes, and renaming each scene according to the corresponding track markers, we can use each scene's Launch button to fire each track section on-the-fly. Open up the project and take a look for yourself.